31 Mar 18. In one of the worst kept secrets in the world, the MoD announced today that British Army has taken a step towards exploring a deal for a fleet of new armoured vehicles, potentially supporting at least 1,000 British jobs, by announcing it is re-joining the Boxer programme today. The UK will re-join the Boxer programme and explore options to equip the Army with the 8×8 troop carriers to modernise its vehicle fleet and meet the Army’s Mechanised Infantry Vehicle requirement. BATTLESPACE Comment: The appointment of General Sir Nick Carter as the new Chief of the Defence Staff was a huge boost to the Boxer selection as he had expressed preference for a sole source selection of Boxer rather than an expensive drawn out competition. 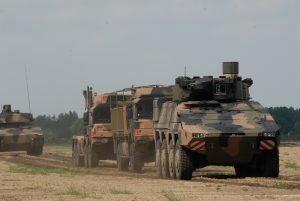 The selection by Australia of Boxer was also a big boost to the vehicle’s prospects for the UK. With access to the full datapack and IP from OCCAR, no VAT and crucial UK DNA in the original design, the other competitors, Nexter, GDUK and Patria, had to run hard to beat this selection. Key UK Partners are Raytheon for GVA, Power Modes and Training, Thales for comms, Bowman integration and Command Post version, William Cook for castings, Marshalls for the ambulance version, BAE Systems, DB Santasalo for the angular gearbox, Parker Hannifin for rear ramp hydraulics, Rolls-Royce MTU for engines and WFEL for welding. The next stage will see a selection of a Prime Systems Integrator which will be bid by the likes of Thales, BAE Systems, Lockheed Martin and Raytheon. Was sneaked out over the Easter break to minimise reaction of the losers?! Previous PostNATO-EU Cooperation: Don’t Forget Berlin Plus! Share By Nicholas Williams, Senior Associate FellowNext PostAirbus Helicopter UK Goes From Strength To Strength By Howard Wheeldon, FRAeS, Wheeldon Strategic Advisory Ltd.